Mother's Day may be a month away, but it doesn't hurt to start getting some ideas (especially since I can be a total procrastinator during the gift giving holidays!). I usually try to look for unique and whimsical presents to give to my friends and family, and Uncommon Goods has quite the collection. It's the perfect place to find the present you know someone doesn't have, whether you're looking for something special, clever, offbeat, or even personalized. Custom Baby Footprint Necklace ($220) - Perfect for a new mother or grandmother. Handmade from recycle sterling silver, each pendant is personalized with a scanned image of a baby's footprints. Mom Vase ($32) - Sweet and simple, this charming milk bottle inspired vase is handpainted with dainty flowers. Fill it with a few small blossoms and tie a thin red ribbon into a bow around the bottle neck. 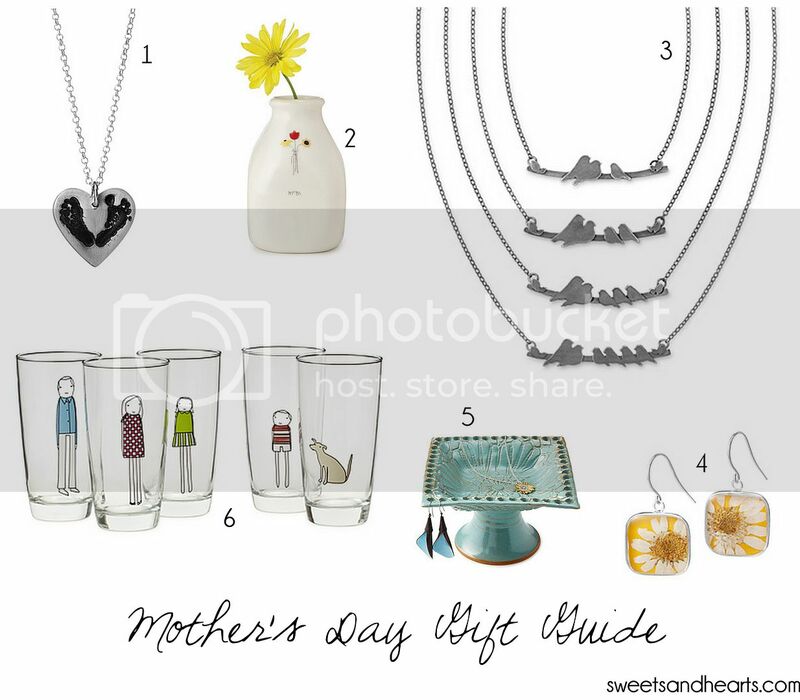 Parent Nestling Necklaces ($70-$79) - My favorite out of the bunch! These adorable little lovebirds sit on a branch with 1-4 baby birds. Handmade from oxidized silver. Birth Month Flower Earrings ($40) - Truly special and unique to the wearer, each pair features real flowers sourced from around the world. There's even a gorgeous matching necklace available here. Pedestal Jewelry Stand ($45) - Practical and beautiful, each stand is imprinted with vintage fabrics and molded by hand. Such a lovely display piece. Family Glassware ($12 each) - These fun and quirky glasses are adorned with illustrations that can represent everyone in your family (even the family pets!). There is so much more on the site! Check out some of Uncommon Goods personalized jewelry here, or shop the rest of their Mother's Day gifts here.